Metals, in their pure state, have a shining surface. This property is called metallic lustre. The metals are generally hard. The hardness varies from metal to metal. Some metals can be beaten into thin sheets. This property is called malleability. Did you know that gold and silver are the most malleable metals? 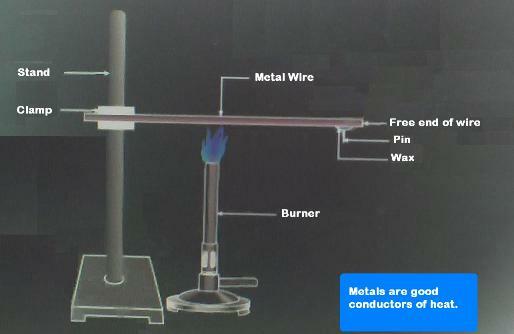 The metals are good conductors of heat and have high melting points. The best conductors of heat are silver and copper. Lead and mercury are comparatively poor conductors of heat. Take samples of iron, copper, aluminium and magnesium. Note the appearance of each sample. Answer: They have a shining surface. Clean the surface of each sample by rubbing them with sand paper and note their appearance again. Answer: They become more shiny. Take small pieces of iron, copper, aluminium, and magnesium.Try to cut these metals with a sharp knife and note your observations. Answer:They are very hard to cut. Hold a piece of sodium metal with a pair of tongs. CAUTION: Always handle sodium metal with care. Dry it by pressing between the folds of a filter paper. Put it on a watch-glass and try to cut it with a knife. Answer: Sodium can be cut easily with knife. Take pieces of iron, zinc, lead and copper. Place any one metal on a block of iron and strike it four or five times with a hammer. What do you observe? Record the change in the shape of these metals. Answer: The metals take the form of sheets on beating. Consider some metals such as iron, copper, aluminium, lead, etc. Which of the above metals are also available in the form of wires? Answer: Iron, copper and aluminium..
Take an aluminium or copper wire. Clamp this wire on a stand, as shown in Figure. Fix a pin to the free end of the wire using wax. Heat the wire with a spirit lamp, candle or a burner near the place where it is clamped. What do you observe after some time? Answer. After some time the wax melts and the pin falls down. Note your observations. Does the metal wire melt? Answer. No, the metal wire does not melt. Set up an electric circuit as shown in Figure? Place the metal to be tested in the circuit between terminals A and B as shown. Does the bulb glow? What does this indicate? Collect samples of carbon (coal or graphite), sulphur and iodine. Carry out the Activities 3.1 to 3.6 with these non-metals and record your observations. Take a magnesium ribbon and some sulphur powder. Burn the magnesium ribbon. Collect the ashes formed and dissolve them in water. Test the resultant solution with both red and blue litmus paper. Is the product formed on burning magnesium acidic or basic? sulphur to collect the fumes produced. Add some water to the above test tube and shake. Test this solution with blue and red litmus paper. Is the product formed on burning sulphur acidic or basic? Can you write equations for these reactions? CAUTION: The following activity needs the teacher’s assistance. It would be better if students wear eye protection. Hold any of the samples taken above with a pair of tongs and try burning over a flame. Repeat with the other metal samples. Collect the product if formed. Let the products and the metal surface cool down. What flame colour did you observe when the metal burnt? How does the metal surface appear after burning? Arrange the metals in the decreasing order of their reactivity towards oxygen. Are the products soluble in water? CAUTION: The following activity needs the teacher’s assistance. Collect the samples of the same metals as in Activity 3.9. Put small pieces of the samples separately in beakers half-filled with cold water. Which metals reacted with cold water? Arrange them in the increasing order of their reactivity with cold water. Did any metal produce fire on water? Does any metal start floating after some time? Put the metals that did not react with cold water in beakers half-filled with hot water. For the metals that did not react with hot water, arrange the apparatus as shown in Figgure and observe their reaction with steam. Which metals did not react even with steam? Arrange the metals in the decreasing order of reactivity with water. Question 1. Which of the following pairs will give displacement reactions? Answer. (d) AgNO3 solution and copper metal. Question 2. Which of the following methods is suitable for preventing an iron frying pan from rusting? Answer. (c) zinc is more reactive than tin. Question 5. You are given a hammer, a battery, a bulb, wires and a switch. Answer. We have learnt that Metals are lustrous, malleable, ductile and are good conductors of heat and electricity. They are solids at room temperature, except mercury which is a liquid. Non-metals have properties opposite to that of metals. They are neither malleable nor ductile. They are bad conductors of heat and electricity, except for graphite, which conducts electricity. (a) Here to distinguish between samples of metals and non-metals using hammer first, we will hammer the given samples of metals and non-metals one by one. We know some metals can be beaten into thin sheets. This property is called malleability. For example gold and silver are the most malleable metals. The samples which, can be converted into thin sheets on hammering hence, are metal where as Non-metal are brittle and can not be beaten into thin sheets. 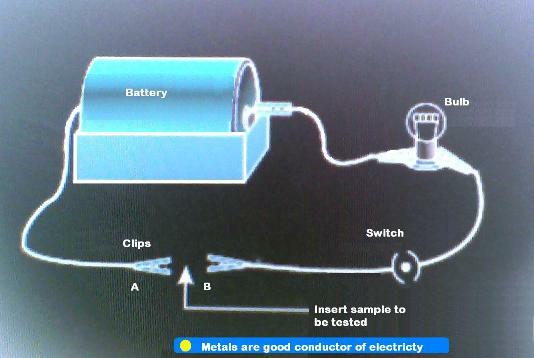 The given test sample is connected in searies, and when we turn on the switch, if the bulb glow, given sample is Metal if it does not glow then it is a Non-metal. (b)The method above is pretty useful except for graphite which despite being a Non-metal is good conductor of electricity. Question 6. What are amphoteric oxides? Give two examples of amphoteric oxides. well as bases to produce salts and water are known as amphoteric oxides. Question 7. Name two metals which will displace hydrogen from dilute acids, and two metals which will not. Question 8. In the electrolytic refining of a metal M, what would you take as the anode, the cathode and the electrolyte? Answer. In this process, the impure metal is made the anode and a thin strip of pure metal is made the cathode. A solution of the metal salt is used as an electrolyte. 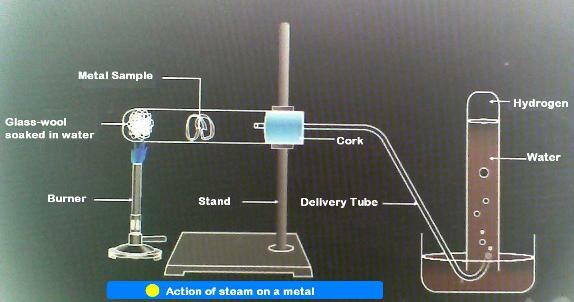 The apparatus is set up as shown in Figure. On passing the current through the electrolyte, the pure metal from the anode dissolves into the electrolyte. An equivalent amount of pure metal from the electrolyte is deposited on the cathode. The soluble impurities go into the solution, whereas, the insoluble impurities settle down at the bottom of the anode and are known as anode mud. Electrolytic refining of copper. The electrolyte is a solution of acidified copper sulphate. The anode is impure copper, whereas, the cathode is a strip of pure copper. On passing electric current, pure copper is deposited on the cathode. Question 9. Pratyush took sulphur powder on a spatula and heated it. He collected the gas evolved by inverting a test tube over it, as shown in figure below. (i) The gas will not have any effect on dry litmus. (ii) The gas will turn blue litmus red in moist state. Question 10. State two ways to prevent the rusting of iron. Answer. Two ways two ways to prevent the rusting of iron. (i) Galvanization: In this method, for preventing the rusting of iron and steel, they are coated with a thin layer of a Zinc. The galvanised iron article is protected against rusting as layer of zinc isolate the iron surface with moist air hence prevent rusting or corssion due to oxidisation..
(i) Painting : In this method, for preventing the rusting of iron and steel, they are coated with a thin layer of a paint. The painted iron article is protected against rusting as layer of paint isolate the iron surface with moist air hence prevent rusting or corssion due to oxidisation. The galvanised article is protected against rusting even if the zinc coating is broken. Question 11. What type of oxides are formed when non-metals combine with oxygen? (a) Platinum, gold and silver are used to make jewellery becuase they are very less. (b) Metals such as potassium and sodium react so vigorously that they catch fire if kept in the open.Hence, to protect them and to prevent accidental fires, they are kept immersed in kerosene oil. (c) Aluminium does not corrode and is a very good conductor of heat. (d) It is easier to obtain a metal from it oxide, as compared to its sulphides and carbonates. Therefore, prior to reduction, the metal sulphides and carbonates must be converted into metal oxides. Question 13. You must have seen tarnished copper vessels being cleaned with lemon or tamarind juice. Explain why these sour substances are effective in cleaning the vessels. Answer. Copper oxide reacts with acids but copper itself does not react. So the copper can be washed by acidic subtances. It removes the corroded part (copper oxide) and pure copper is left behind. Question 14. Differentiate between metal and non-metal on the basis of their chemical properties. (i) Iron formation: Metals from positive ions and non-metals form negative ions. (ii) Acidic nature: Metals form basic oxides and non-metals form acidic oxide. (iii) Reaction with water: Metals react with water but non-metals do not. futile argument the man beat a hasty retreat. Can you play the detective to find out the nature of the solution he had used? Answer. The solution, he used was aqua regia. Question 16. Give reasons why copper is used to make hot water tanks and not steel (an alloy of iron) is not. Answer. Hot iron reacts with steam formed by boiling water. But, copper does not react with water. Question 1. What happens when iron is heated to a high temperature. Answer. Iron does not burn on heating but glows brightly. Question 2. What happens when copper is heated to a very high temperature. Answer. Copper does not burn, but the hot metal is coated with a layer of black substance known as copper(II) oxide. Question 3. Write an experiment to show that copper does not react with dilute HCI and H2So4. Answer. The small piece of magnesium, zinc, aluminium, iron and copper. Clean their surfaces by rubbing with a sand paper. Place these metals in separate test tubes. Add about 10 mL dilute hydrochloric acid to each of these test tubes. Observe carefully the rate of formation of bubbles. Question 4. Write the physical properties of metals. (i) All metals except mercury are solid at room temperature. (ii) Metals possess metallic luster. (iii) They are malleable and and ductile. (v) They (except sodium) are sonorous and have high density. (vi) They are generally hard except sodium and potassium. (vii) Metals have high boiling and melting points except sodium and potassium.